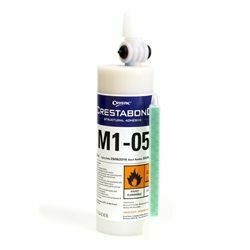 Crestabond M1-05 is a toughened, two component 10:1 MMA structural adhesive which is designed for bonding a wide range of substrates including metals, plastics and composite materials in industrial applications. This adhesive demonstrates excellent impact, peel, shear, compressive strength and fatigue resistance properties across all bonded parts. Crestabond is a primer-less MMA adhesive, requiring minimal surface preparation helping to reduce overall production costs and increase productivity. Crestabond M1-05 has a working time of between 4 and 7 minutes.